So what do Itchy and Scratchy have to do with Cain and Abel? And what do both stories have to do with us … and our spiritual unfoldment? Fasten your seat belts … here’s our opinion! 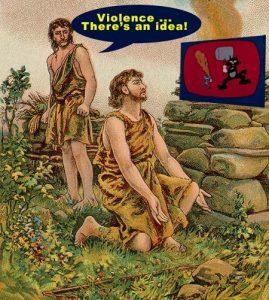 The Backstory of Cain and Abel, and Itchy and Scratchy, et. al. The story of Cain and Abel can be found in Genesis 4:1-18. The Cliff Notes version is that out of anger and jealousy because God favored Abel’s offering over his, Cain takes his brother, Abel, out into the fields and kills him. He then lies to God, but God knows better and banishes Cain to become a restless wanderer. Cain whines that he will be killed, so God has mercy and sets some kind of mark on him as protection so no one would slay him. Interestingly, Cain and Abel aren’t the first brothers, nor are they the last, who found themselves angry with one another! As a matter of fact, all over the world, mythologies record the dissension between a pair of brothers, oftentimes twin brothers, who are at odds. For example, in Hindu mythology, the Ashvins were a pair of handsome Vedic gods who were twins and who were mythologized to be divine physicians and protectors. One twin symbolized sunrise and the other sunset, making them opposites. In Egyptian mythology Seth murders his twin brother Osiris (the Egyptian Christ) and puts the body of Osiris in a chest on the river. When the boat arrives at the shore from that place springs up an acacia tree, which grows up around the chest to protect Osiris. It is also believed that Roman centurions cut the crown of thorns they placed around the head of Jesus of Nazareth from an acacia tree. According to ancient traditions, acacia wood symbolizes the power and significance of sacrifice. Another pair of mythological twins are the Dioscuri twins, Castor and Pollux, who were sons of Zeus. They were horsemen and seafarers and were the origin of the Zodiacal sign Gemini. Their mother was Leda, but Castor was the mortal son of Tyndareus, the mortal king of Sparta, and Pollux was the divine son of the god Zeus, who had seduced Leda in the guise of a swan. The brothers later joined the crew of Jason and the Argonauts. The tale of twin brothers who are at odds isn’t over yet. Many scholars point to the similarities between the Sumerian tale of Emesh and Enten and the biblical tale of Cain and Abel. 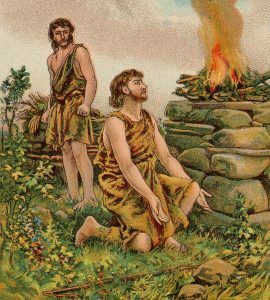 The Emesh and Enten tale is ‘the closest parallel to the Biblical Cain and Abel story’ for a good reason. 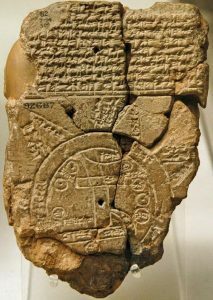 The Emesh and Enten tale is found on clay tablets from the 3rd millennium BCE, while the oldest source of the Hebrew Bible is thought to have been written during the 6th century BCE. So, the Sumerian myth predates the Biblical account. In the Sumerian tale, the god Enlil couples with the Earth, which gives birth to twin boys named Emesh and Enten. Emesh symbolizes the freshness of summer and Enten represents the dormancy of winter. Each brother brings an offering to Enlil, but Enten becomes angry with Emesh and the two brothers argue. At this juncture, however, the similarities end. In the Sumerian tale, the boy’s father god Enlil intervenes and decides in favor of Enten. Emesh accepts Enlil’s ruling and the brothers reconcile. However, in the Hebrew Genesis account, Cain murders his brother Abel. 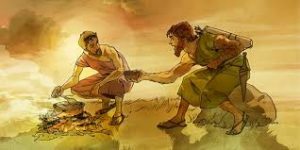 Before we enter into the Cain and Abel story in Genesis, Chapter 4, there is another Bible story about a pair of twin brothers who get into conflict with each other. It’s the story of Jacob (also called Israel ‘he who wrestles with God’)2 and Esau (the hairy one). According to the Biblical account, Jacob flees from his twin brother Esau, whom he had tricked out of receiving their father Isaac’s blessing which was customarily bestowed on the first-born. For centuries mainstream religion has missed the deeper spiritual meaning of this age old archetypical story by labeling it as the literal struggle between two brothers. However, the perennial struggle these archetypical brothers represent is within each of us. Cain and Abel, as well as all of the twins we mentioned above, including the two animated fictional cartoon characters, Itchy and Scratchy, represent two very different natures within us, and the grand struggle they symbolize involves the unnecessary incompatibility between these two natures, one which is Cosmic Christcentric1 and the other egocentric. In all of these stories, the brothers are two sides of us (left and right hemispheric, head and heart, egocentric and Christ-centric) and aspects, thoughts, inclinations, and propensities within us – and not just between brothers. Internal division and conflicting thoughts and feelings apply to all of us – men, women and children. We all have in us both Cain and Abel, Emesh and Enten, Castor and Pollux, Romulus and Remus, Jacob and Esau, Ašvieniai and Ashvins … and maybe even Itchy and Scratchy. So, let’s take a look at the Biblical account of Cain and Abel. Abel’s name literally means ‘breath or spirit (pneuma),’ and represents our Higher Spiritual Nature. Cain’s name means ‘the personality that is created in each skin school lifetime and produces ‘fruit of the sensory experience,’ rather than of Spirit. Cain symbolizes our lower, sense-prone nature. Cain is the older twin, because our Higher Nature is embodied in our earthly self. Adam symbolizes the archetypical movement in mind that epitomizes the reasoning, reductionist, objective, logical, deductive, methodical, and judgmental nature of our make-up. Adamic energies underwrite our left hemispheric brain-ness and are very much tied to our thoughts when we incarnate into human form. Eve represents the archetypical pattern in our heart-centered awareness that epitomizes the nurturing, highly intuitive, wisdom-centered, subjective, unconditional love-oriented, social and emotive nature of our make-up. 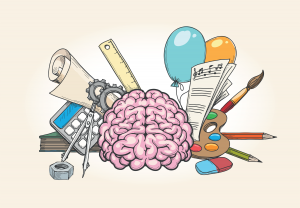 Eve energies underwrite our right hemispheric brain-ness and are connected very psychically to our feelings when we incarnate into human form. The archetypical mythical couple Adam and Eve3 show us that if the polarities between the head and the heart and left hemisphere and right hemisphere do not fully resonate, the products of their union (Cain and Abel, Romulus and Remus, etc.) will exhibit the disequilibrium and conflict that characterize the original disconnect. And that’s what happens in the story. On the other hand, the struggle is about our Cain-ness because the ego is always in a constant struggle to kill off our higher, more spiritual nature. The ego wants total control because to sacrifice its temporal rulership is to die to our worldly self and let our Christ Nature live through, in, and as us! “And in the process of time it came to pass, that Cain brought of the fruit of the ground an offering unto the Lord. And Abel, he also brought of the firstlings of his flock and of the fat thereof. And the Lord has respect unto Abel and to his offering: But unto Cain and to his offering he had not respect” (Gen. 4:3-6). Our Cain-ness identifies solely with the physical senses. This is why we hesitate to sacrifice our egocentric personality (persona) to anything that seems spiritual. Given this mentality, the best things we can offer to our God Nature are the products of our physical senses. When we offer up those kind of worldly attachments, our Higher Nature (God Essence) is vibrating at too high of a spiritual octave (is displeased) for the lower vibrational sensory attachments to register in our super-consciousness (Christ Consciousness). Since worldly offerings are left-brain generated ‘fallout’ based on earthy desires, we tend to feed our own selfishness first and what is left over – if anything — is relegated for our own spiritual growth and development: “First I’m going to have this career; first I have to win the lottery; first I must have a house; first I’ve got to finish my doctorate; first I’ve … , then I’ll concentrate on my spiritual growth (give my offering to God).” That’s our Cain-ness talking! When we look beneath the literal interpretation, we discover that Cain’s fruits, the fruits of a worldly ego, have no lasting or permanent qualities and cannot provide us the happiness, inner peace, and joy that come from a disciplined and devoted truth walk. In Genesis 4:8 Cain (our sense-addicted ego) kills (stifles, represses, denies) Abel (our spiritual tendencies)! Shortly after the ‘murder’ of our tendencies toward our Higher Nature, which symbolically represents our ego reasserting its dominance over our human personality, our innate Divinity remains vital, but dormant (curses), and continues to underwrite our physical being (tells Cain that he will be ‘a fugitive and a vagabond in the earth). A few verses later the author of Genesis tells us that Cain “went out from the presence of the Lord, and dwelt in the land of Nod…” (Genesis. 4:16).4 The Hebrew word for ‘Nod’ means to ‘wander, drift or stray.’ This is another clue that the Land of Nod symbolizes a special kind of existence. As you can see, allegorically, the twin brother’s battle takes place within us. It is a well-known theme throughout antiquity. Although our Christ Nature underwrites our human nature, it is our human beingness that must choose to access our Divine Nature. We can stay stuck in our Cain-ness and repress our innate divinity or awaken to who we really are – a spiritual being having a human experience. Choose wisely, as you walk the spiritual path on practical feet! BONUS — Just for fun: Since time is non-linear in Quantum Physics, what if Cain really got the idea of using violence on Abel from Itchy and Scratchy? Hmmmm? 1 We use the term Cosmic Christ-centric since the story appears in the Bible; however, we can just as easily say Buddha-centric, Krishna-centric, Allah-centric, Great Spirit-centric, etc. 2 See our posts on this website called Jacob’s Ladder and Jacob’s Pillow Stone. 3 See our Adam and Eve post. 4 See our Mark of Cain post.